The Mitchell Auditorium is committed to making its facilities accessible to all our patrons. For additional information or if you have questions, need assistance, or an accommodation not mentioned below, please call the Box Office Manager at: (218) 723-7000. For complete details, read the full accessibility and grievance policy. The Mitchell Auditorium Ticket Office staff is trained to assist you in acquiring seating that best meets your individual needs. There are wheelchair accessible locations, as well as transfer seats with removable armrests for those who would like to transfer out of their wheelchair. These seats are located on the main level adjacent to the theater entrances. The Mitchell Auditorium does not provide wheelchairs. Elevators are available to bring patrons to the theater level and to the upper seating. To talk to our ticket office staff about accessible seats, call (218) 723-7000. There are two (2) wheelchair accessible restrooms located in the foyer by the main entrance to the auditorium. Wheelchair accessible restrooms are also located on the ground level near the main entrance to the building. Wireless assistive listening devices are available at no charge (subject to availability) for all performances at the Mitchell Auditorium. Patrons may request a headset from the ushers. Headsets may be used with or without a hearing aid. Cued speech translation is available upon request at the discretion of management, with at least three (3) weeks notice, and dependent on the availability of a qualified interpreter For more information, call the Mitchell Ticket Office at (218) 723-7000. Parking for patrons with disabilities is available in the Mitchell Auditorium parking lot, in front of the Chapel and in front of Somers Hall. The Mitchell Auditorium is accessible by the Duluth Transit Authority bus system with the closest bus stop in front of Tower Hall by the Chapel. For more information on public transportation call the Duluth Transit Authority at (218) 722-7283 or visit the Duluth Transit Authority website. The Mitchell Auditorium is located on the campus of The College of St. Scholastica in Duluth, Minnesota. The campus is approximately 150 miles north of Minneapolis - St. Paul, 4 miles east of Superior, Wisconsin and 160 miles from the Canadian border. The information below has been prepared to assist you with your questions concerning the Mitchell Auditorium. It will also alert you to unique situations that touring shows typically encounter in this space. We look forward to meeting you and doing everything we can to provide the best possible facility at the Mitchell Auditorium. State-of-the-art acoustics, excellent sight lines and technical equipment make the Mitchell Auditorium able to accommodate meetings, seminars, lectures, along with many other events, in addition to serving its primary function as a performing arts center. There are 585 theater-style seats in tiered rows. Provisions for the physically challenged include space for six wheelchairs and assistive-listening devices. Three VIP dressing rooms are directly behind the stage, which are accessible to the crossover. Each dressing room is equipped with a make-up mirror, sink and private toilet. Two of the dressing rooms are larger and may accommodate groups. The Mitchell Auditorium foyer is ideal for receptions and vending displays. The foyer is 26' x 57'8" and accommodates up to 150 people. Adjacent to the foyer and the auditorium is a fully equipped kitchenette, well suited for smaller meetings and event catering. The kitchenette is 21' x 26' and accommodates up to 30 to 40 people depending on the room arrangement. 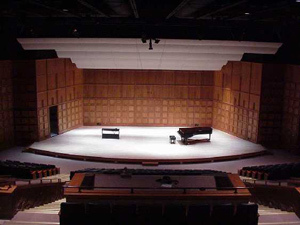 • Stage Floor Height: 1'6"
Mitchell Auditoium is a music hall. It does not have a proscenium. There is no orchestra pit or fly rail. Performers may enter the stage from right or left using the double oak doors. There is a crossover behind the stage where the dressing rooms are located. There is limited wing space, as well as very little storage off stage for any extra scenery. The Mitchell Auditorium has no fly system. There are three battens dedicated for electrics which are permanently dead hung. The battens become lower as they go upstage. The upstage back wall has a batten able to hang a cyc. You provide the cyc. Finished cyc is 21' high by 40' wide. Because there are no additional battens, the space cannot be masked. There is no main curtain, scrim, blackout curtain. The stage has a sprung maple dance floor. Nailing and screwing into the stage floor is not permitted. Taping is not allowed. The stage floor is level and is waxed and polished. 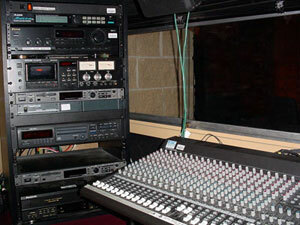 * Additional A/V equipment can be made available and will carry an additional rental charge. All performances are staffed by paid students who are selected, trained and supervised by the Mitchell Auditorium Director. (All crew calls must accommodate student schedules). The door for unloading and loading into the backstage area is located to the right when facing the Mitchell Auditorium. Trucks are able to back into the loading area, however, drivers should be advised that there is no turn-around space. The loading dock is not at truck level and requires taking items up/down eight stairs. The door access to the backstage is 2' 10" wide by 6' 10" high. The door measures 5" above the steel grid landing, which measures 5' 2" x 5' 6". There is an optional double door entrance on the right side of the building. This door enters directly into the seating area of the auditorium. The mullion CAN NOT be removed, the landing handrail is permanent, and the stage is 1' 6" higher than the threshold. The double door measures 30" wide by 7' high and is 5" higher than the steel grid landing. The landing measures 5' 2" x 8' 6" and is 3' 6¼" from the ground. A public elevator is available if unloading is done in front of the Mitchell Auditorium. The elevator's dimensions are 4' 3" x 6' 8½" with a door width of 3' 6" and height of 7'. The elevator capacity is rated at 2,500 lb. The elevator has access to a backstage door that measures 5' wide by 6' 9" high. A mixing board may be set up in front of the control booth. The snake run to the stage apron is approximately 32'. The console is a Macki SR 2400.4 series with 24-channel mixing board with phantom power supply, four sub outs, two main outs, and six auxiliary outs. The auxiliaries have been designated to operate the paging/stage monitor, RF hearing impaired help systems, return monitors, VCR recording and an Alesis Mediverb. Ten (10) XLR microphone jacks are located along the front of the stage apron. There are two (2) additional XLR microphone jacks located on the upstage wall and Four (4) 1/4" monitor jacks along the stage apron. • (6) - Ashly GQX 1/3 Octv EQ(1)-EV AP2300 2 x 100 Watt Amp. * A list of frequencies used at St. Scholastica is available upon request. We have the capability to produce four (4) monitor mixes. The monitor inputs are located across the front of the stage. They can be plugged into either pre or post fade auxiliaries. The Mitchell Auditorium is equipped with a two-channel Clear Com communications system, six (6) belt packs and six (6) single muff headsets. These may be assigned to either A or B channel at seven locations in the Mitchell Auditorium including backstage right, lighting alcoves and above the control booth. Both channels can be accessed from wall mounted units in the control booth by the sound operator and light board operator. In addition to the Clear Com system, the Mitchell Auditorium has a white courtesy phone system that can be operated from eight stations. These stations are in the following areas; control booth, back stage right, all four dressing rooms and the ticket booth. Each station is capable of contacting the control booth, back stage right and house manager. Only the control booth and back stage right stations are capable of contacting all stations. The paging system does not have foldback capabilities. Speakers for the paging system are located in the control booth, back stage right and left and in all four dressing rooms. Each of these speakers has independent volume control and can individually monitor the stage using the two (2) microphones located above the stage. The paging system is controlled by auxiliary one (1) on the sound mixer. The Clear Com, the white courtesy phone and the paging systems all have low impedance auxiliary inputs located in the control booth. The Mitchell Auditorium is also equipped with a video monitoring system. This system has two (2) stations-one located in the technical booth and the other backstage right at the Assistant Stage Manager's station. We have integrated a hi-fi VCR into the system for recording purposes. Mitchell Auditorium technical personnel are more than happy to record your event with authorization from the performer(s) and/or the performer(s)' management. 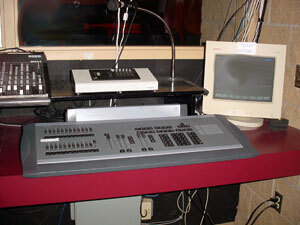 The booth contains an ETC Express 125 V3.1 control console. Shows can be saved or loaded on to the board for easy programming. House lighting is on a separate manual fader controlled from the booth or from back stage right. Certain areas of the house can be controlled individually. 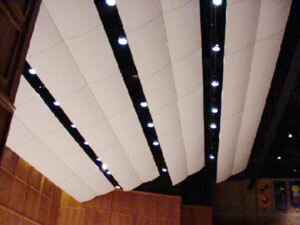 Mitchell Auditorium uses a dimmer per circuit system for house light control. There are 48 active Strand CD 80 2.4K dimmers. In addition, the stage lights are controlled by an ETC Sensor Dimmer System. It has 48 dimmers, and works on a dimmer per circuit system. There is no company switch available for additional power, nor is there any disconnect panel to transfer circuits to a road box. All cable, batten circuits, and lighting instruments are 20 amp, stage pin receptacles. Optional lighting positions throughout the Mitchell use different receptacles. The stage floor pockets use three pin twist locks (ground in) and the stage apron uses a combination of three pin twist locks and Edison receptacles (U-ground). Click here to download a Lighting Placement diagram (PDF). There is one 54' length beam with 16 circuits across which is 33' feet from the stage apron. The throw to the stage apron is 38' (measured parallel to the center line) and is 45 degrees to the horizontal. The beam uses stage pin receptacles. There are two lighting alcoves (balcony runways) which have three circuits each. The lighting alcove uses three pin twist locks with the ground in. Each of the two floor pockets stage left/stage right have three circuits. The floor pockets use three pin twist locks with the ground in. The front of the stage apron holds four circuits that are duplicated, one above the other. These circuits are interchangeable with three pin twist locks with the ground in and Edison receptacles (U-ground). The three electrics above the stage are dead hung between acoustical panels that prevent instruments from being finely focused upstage or downstage. Because there is no fly system or catwalk, all light instruments must be hung and focused using a Genie Lift which must be reserved in advance. There are grounded Edison (U-ground) outlets in four duplex boxes around the front of the stage apron which are on 20 amp circuits. These policies, including procedures and the fee schedule of the Mitchell Auditorium serve as the guidelines for use of the auditorium by any individual or organization. The policies and fees are subject to change without notice. Show/Performance/Event - Shall mean each show, performance, preview with audience, recital, lecture, meeting or event of any kind that is contracted to be given at the Mitchell Auditorium under the terms of these Policies and a Rental Agreement. Load-In - Shall mean that the time specified in the Rental Agreement at which a user shall first have the right to move its property into the Auditorium. Work Call - The time specified beyond the load-in time for additional stage or technical work. Curtain - Shall mean the time specified in the Rental Agreement on which a show or performance, as defined above, shall begin. Load Out - Shall mean that time specified in the rental agreement, following a performance which shall be reserved to enable a user to remove its property from the Auditorium. Inventory - Shall mean the master list of physical property, owned by The College of St. Scholastica and located in the Mitchell Auditorium, that is available for use by a user. General Policies - Policies remain in effect for the duration of the Rental Agreement. Rental Agreement - Rentals of the Mitchell Auditorium originate in the office of the Mitchell Auditorium . Potential users will be notified by the Mitchell Auditorium Director to whether the auditorium is available on the date(s) requested and whether approval to rent the auditorium is granted. If approved, the potential user will be sent a Rental Agreement, which must be signed and returned with a deposit and, if applicable, any artist's contract(s) within ten (10) days. Artist Contracts - The Director shall review any contract a potential user intends to make with an artist prior to signature. Management - The office of the Mitchell Auditorium retains control of management of the Mitchell Auditorium's audience and the enforcement of these policies. Only approved personnel will be allowed to operate stage equipment, sound and lighting systems. Tickets, reserved and general admission, may be sold through the Mitchell Auditorium Box Office. A charge will be added for Box Office services. The Mitchell Auditorium Box Office is equipped to handle Visa, MasterCard and DIscover transactions. It is the policy of the Mitchell Auditorium to pass transactions fees on to the user. The Mitchell Auditorium Box Office shall be staffed by St. Scholastica personnel only. The user agrees to abide by all Mitchell Auditorium Box Office procedures pertaining to ticket sales. A consultation with the Mitchell Auditorium's Management to arrange for house management and technical services. A walk through of the space to arrange set up needs. Floor - No structure, painting, nailing, screwing or other activity which may damage or mar the floor will be allowed on the Mitchell Auditorium stage. Clean Up - Users shall clear the stage of all users' equipment immediately after the final performance. Exceptions to this policy must be approved by the House Manager or Director. Enforcement/Property - Before, during and after rehearsal(s) and performance(s), the user will be responsible for the use of dressing rooms. Dressing rooms are not locked during or between performances. The user is responsible for the property of its performers and crew during the rental term. Damage - User will be responsible for replacement of any equipment damaged due to improper use by the user or user's personnel. Presence of Staff - The Director, or a designated technician appointed by Mitchell Auditorium Management, will be present during all performances in the auditorium. All charges for services, except those set forth in Section G will be passed on to the user. All Campus Buildings are smoke-free environments. Solely upon request, food and beverage service for patrons is available through The College of St. Scholastica's Food Service Department. Request for food service must be received by the office of the Mitchell Auditorium at least ten (10) business days prior to an event. The Mitchell Auditorium reserves the right to display and distribute promotional materials for its own programs held in the Auditorium. Photography is not permitted without advance permission from the Director. Flash cameras, or cameras requiring special lighting, are prohibited at all performances. Audio and video recording may be permitted upon consent of the Director. All audio recordings of performances will be done by Mitchell Auditorium personnel. Costs for this service will be charged to the user. Arrangements for recording must be made in advance with the Director. No outside recording companies will be allowed in the Auditorium to record performances. Audio tapes/disks will only be held for two weeks after event. Latecomers are required to wait outside the auditorium doors until a program break or intermission. Latecomers may, at the House Manager's discretion, be seated in the upper level of the auditorium to wait for a program break or intermission. The Auditorium will be open to ticket holders 30 minutes prior to performance time or at the discretion of Mitchell Auditorium management. Lost and found articles are turned in and may be claimed at the College's Business Office, Tower Hall room 1130. User Fees for Base Periods - Base Rental fee $925 (daily). 1/2 day $675.00 (4 hours) A base period is a segment of time within a given day purchased by the user for use of the Mitchell Auditorium. The base period for rental use of the auditorium with a performance is eight (8) hours. This includes a load-in; a single two hour show; and an hour load-out, all on the day of the show. Usage for more than the base period will be $80 per hour plus technician/usher time, if applicable. More than one show or performance per base period increases the rental rates for the base period by 60%. Rental for the Mitchell for rehearsal is $80 an hour plus TD time and technician time if applicable. Special Multiple Day Use Rate - A negotiated percentage discount on base period fees is available when a number of base periods are purchased extending over several days, weeks or months. Facility custodial prepared prior to occupancy. Permanent fixtures, equipment and dressing rooms, as described in the technical packet. Dressing room, technical systems and front-of-house paging monitor-headset cueing system. Ushers are made available for each event. The user will be charged for ushers at a rate of $10.00 per hour per usher - three (3) hour minimum. Concessions - The sale of any and all merchandise to include, but not limited to, clothing, mugs, toys, CDs, tapes, buttons, souvenirs, programs, brochures, etc., will be sold by Mitchell Auditorium personnel at a rate of 20% commission of total sales or a flat fee of $200. Base Rental fee $925 (daily). 1/2 day $675.00 (4 hours). Rental fee solely for rehearsal $80 per hour. Additional Technical Support Personnel Market rate.